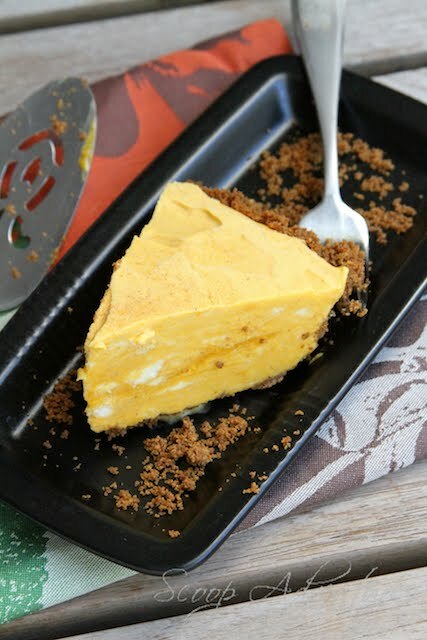 Lindsay over at Scoop Adventures is a genius with ice cream (the classic partner of many a pie) and I am a huge fan of ice box pies so I was excited to see a recipe on her site that combined the two. I love how she used spice cookies to make the crumb crust instead of the more common graham crackers. How much flavor that must add! I also like how she doesn't use pumpkin pie spice (you know how I feel about that) but instead a mix of brown sugar, cinnamon, nutmeg and maple syrup in the creamy pumpkin filling. I think this would be the perfect pie for Thanksgiving since it can be made the day before with no ill effects. Find the recipe for this delish pie at Scoop Adventures. Submit a recipe: If you're a food blogger with a delicious pie recipe you'd like to see featured on this site, here's how to submit it. Thank you for commenting, pie lover! If you're a food blogger with a delicious pie recipe you'd like to see featured on this site, here's how to submit it. Pie Fair Lady rounds up the best recipes for sweet and savory pies of all sizes and varieties. These recipes all feature real, whole foods and were tested by home cooks and food bloggers all over the world. This site was created by Rachel Rappaport who has been sharing her original recipes on her food blog, Coconut & Lime, since 2004. She also loves pie. Ginger Spice Sweet Potato Pie by Me! All text © Rachel Rappaport. Pictures and recipes are the copyright of their respective owners. Simple theme. Powered by Blogger.